in pension funds, insurance companies, investment and mutual funds, and many other firms, CFA charter holders in Sri Lanka and in 149 countries find fulfillinq careers nurturing, safeguarding, and growing the finances of the world. Discover financial careers with the CFA designation. 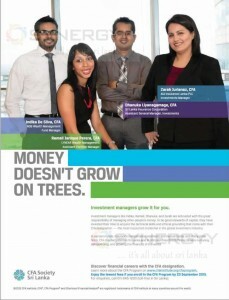 Learn more about the CFA Program on www.cfainstitute.org/cfaprogram.